Trump flies in: Brunetti Speaks out ! Trump's upcoming visit to London is a reason to refresh our inner disgust. Donald Trump is coming to London this week. I wish he wouldn’t but it seems I am unable to prevent it. 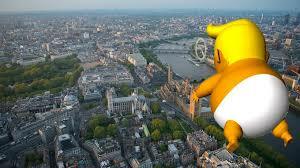 I can only look forward to the sight of the Trump ‘angry orange baby’ blimp flying over the city - permission for which was granted this past week - and pray for a monsoon over Scotland when he goes there to play golf. How tepid is that? How insipid those emotions? What has happened to me? I fear my anger is dying and I want my disgust back, I want to drown my helplessness in vitriol. What is hateful cannot be hated less simply because hatred is so hard to hold on to. Perhaps I have never been a thinking man; my emotional constitution has made me wobbly. I have not honed my intellect into an ice-pick, nor shaped my nature to a passionate fury capable of plunging that instrument precisely and deeply into the disgusting eye of Trump’s bigoted narcissism. I’ve been too temperate, and because I have many failings, too inclined to forgive them in others. Trump, however, demands insistent, constant, unremitting, relentless disgust - because only our disgust will rid us of him and people like him. They are destroying our democracy in front of our eyes and mock us by doing it in democracy’s name. Some months ago, the editorial board of the New York Times devoted an entire page to a list of Trump’s lies, evasions and offensiveness. The person who sent it to me said she had been unable to read it to the end because it had made her cry. Well, we’re all going to have to toughen up, love, and rediscover our disgust. Below are two links for your convenience. They predate his tariff war with China, Canada, Mexico, the European Union, his shaking of his swagger stick at NATO, and the isolation camps for the child prisoners of his border war. The thing is, it’s just not good enough to become inured to the evils and follies of this man, they keep coming at us whether you’re looking or not. It’s not good enough to get tired, and decide there’s nothing to be done, detach, and kind of hope it will all blow through. What Trump is doing to relations between ‘white’ and Afro-Caribbean or Hispanic Americans, between America and Europe, between America and Asia, does not blow through. It’s not a fart in the car, you can’t just all have a laugh and roll your eyes, and wind down the windows. This is damage to the political environment on the ecological scale of Exxon Valdez, Chernobyl, the Gulf of Mexico. Clean-up and recovery will take decades; some important life-forms may never recover. The problem with the Trump blimp is that it is mere mockery. If only he were just an angry baby. He is far more frightening. Jurassic Park (I would have said a zeppelin but that would suggest the Germans and sometimes, between them and the French, I feel they’re our best hope) would be much closer to the truth, more fearful and disgusting, a more prosaic evocation of the nature and scale of the disaster he and all the others - Putin, Orban, Salvati, Le Pen, the Brexiteers - represent to our Western democracies, our values of tolerance and openness, and our cohesion as societies. The problem with that blimp is that it’s not enough. On behalf of humankind, we need to rediscover our disgust of Donald Trump and feed it every day like a vicious bear.